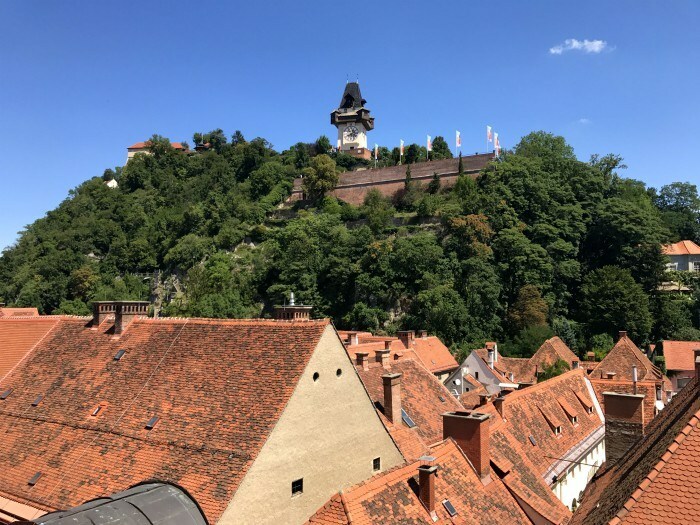 When in Graz you’ll want to climb up the Schlossberg, the hill that overlooks the old city with the famous clocktower on the top. That clocktower is one of the few parts of the fortress that remains after Napoleon demanded it be demolished, after he won victory from the Hapsburgs in 1809 and it has become the symbol of Graz. Just above the clocktower you’ll find Aiola Upstairs, a restaurant and café in a modern glass box, with windows that slide back to make an outdoor terrace in good weather. The menu takes a fresh and modern slant on Austrian produce and cuisine. 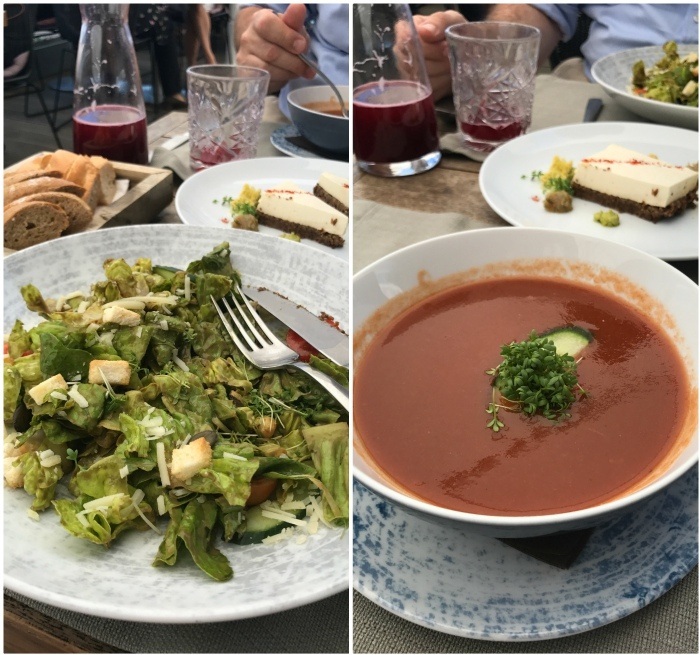 We enjoyed the Styrian Caesar salad, a pumpernickel and cheese tart and a bowl of gazpacho washed down with a fresh berry cordial, all while drinking in the views from the former fortress over the old town. 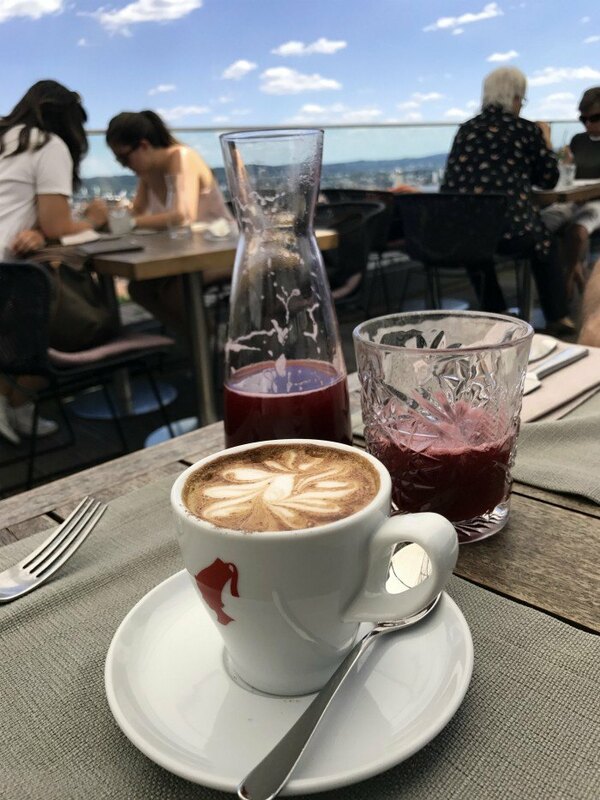 Another spot to eat in Graz with a view, for coffee or lunch, is Freiblick Tagescafé on the 6th floor of the biggest department store in Graz, Kastner and Ohler. 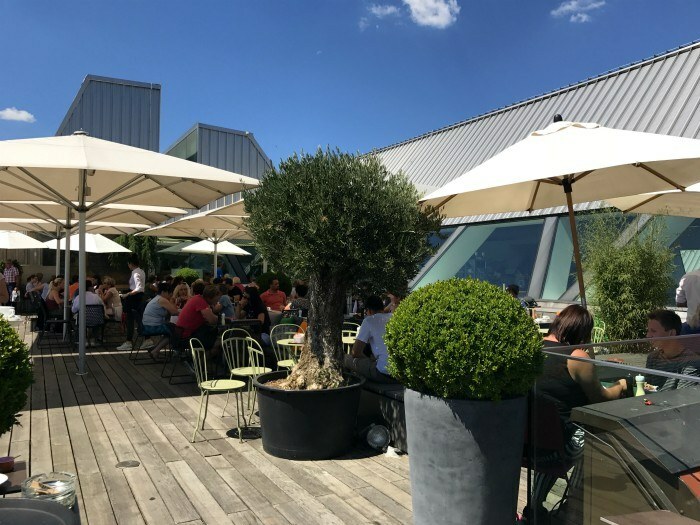 There’s a glass sided indoor cafe, but in good weather you’ll want to head for the outdoor terrace which is normally packed. From coffee and cakes, to early evening aperitif, there’s always a fabulous view of the clocktower on the Sclossberg and the red rooftops of Graz’s historic centre. They’ve thoughtfully made a glass sided platform, so that you can get the perfect Graz selfie with the clocktower behind you. Chocolates are my favourite souvenir to bring back as a gift – although I’m the first to admit that they don’t always make it home! 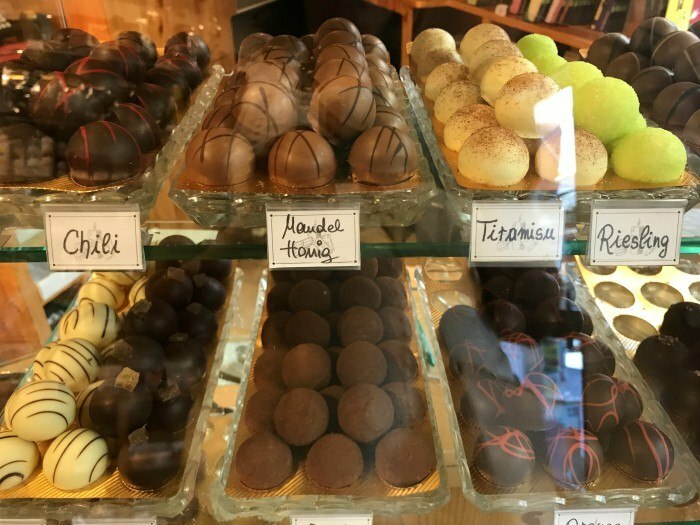 In Graz you’ll find a small but perfectly formed shop for all your chocolate needs at Linzbichler, tucked in the shadow of the Franciscan monastery (take a look at the beautiful cloisters and tranquil garden). 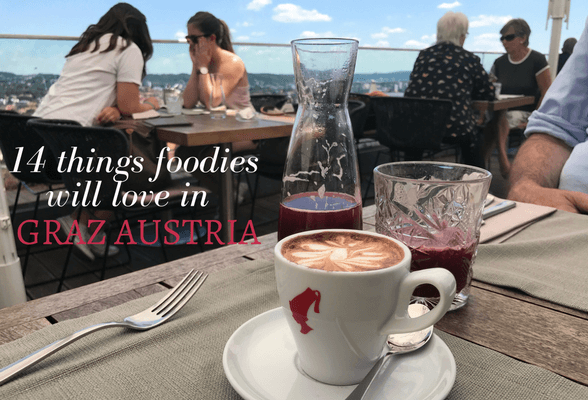 Like most places in Austria you’ll find there is a special chocolate from Graz, which is the Schlossbergkugel, a chocolate ball with truffle filling in a box that will remind you of the clocktower perched on top of the Schlossberg. 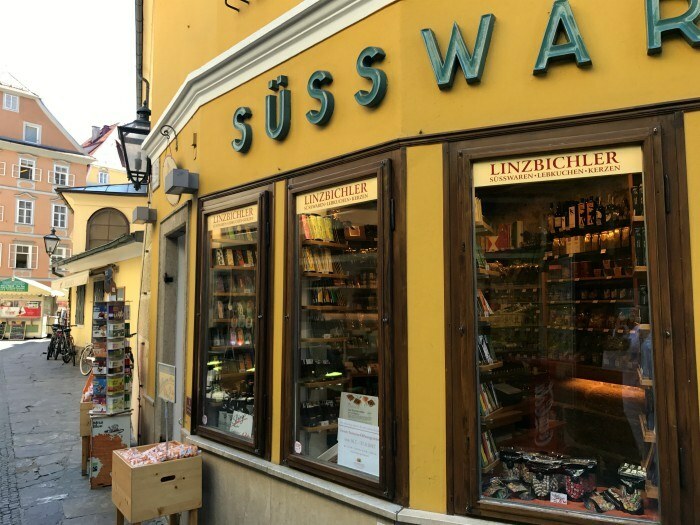 If you do nothing else, pop in to buy a single Schlossbergkugel to sweeten your sightseeing, but I guarantee you’ll be tempted by the packed shelves of artizan chocolate bars, gift boxes and seasonal treats. 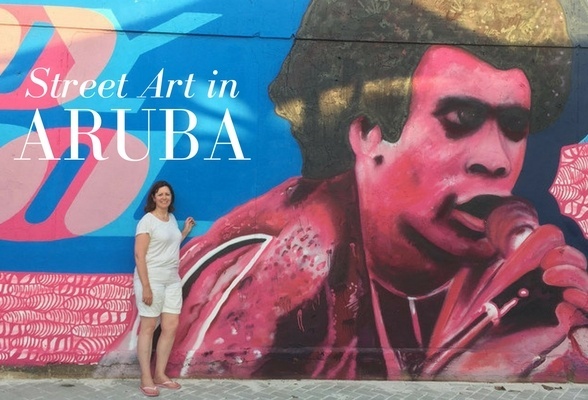 Culture lovers may have heard of the famous Styriarte festival, a celebration of classical music and the arts that takes place in Graz during June and July. We attended a performance of La Margarita, a baroque opera and horse ballet in the beautiful gardens of Schloss Schielleiten, which commemorated the celebrations laid on by Emperor Leopold I for his marriage in 1677. For foodies visiting Graz, it is a happy combination of delicious food from Graz and entertainment, we sipped Styrian cider as an aperitif before heading into the marquee restaurant for a pre-performance dinner of smoked char and caviar, fillet of pork and a white chocolate and raspberry desert. In the gardens by the ornamental pond there was a wine tasting area with 5 different Styrian wines to try, accompanied by a board of local cheese and Volcano ham. At other performances such as the one we attended at Helmut List Halle, there were tasting plates that could be ordered in advance to drink with your wine in the foyer, an ideal option for those who enjoy a harmony of great food and music. If you go: Styriarte Festival will next be held in summer 2018 – tickets are available to book from November 2017. 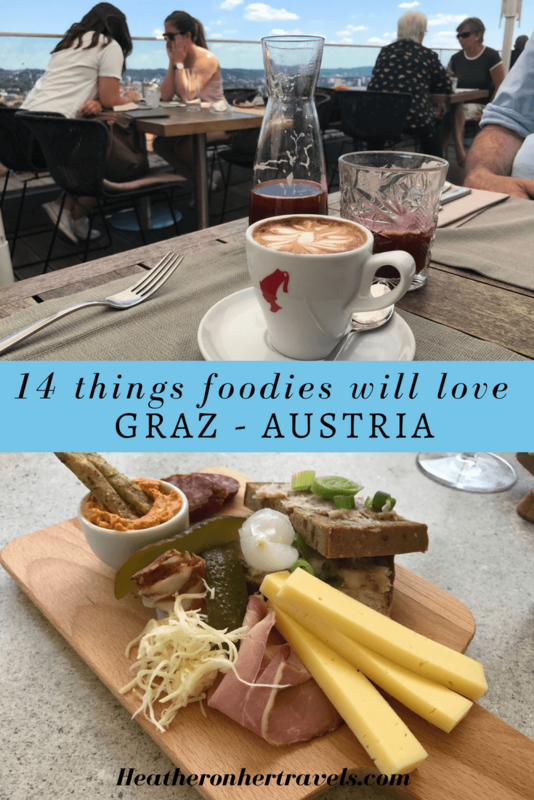 If you can’t see the video above about 20 things to do in Graz, you can download directly here, see it on my blog here or Youtube here and please do subscribe to my videos on YouTube. Explore Graz’s creative quarter, across the river from the old town, with a visit to the Friendly Alien, as the Kunsthaus Graz museum of contemporary art is known. In the turn of the century building adjoining the design museum’s gift shop is the Kunsthaus cafe, with a friendly, youthful feel. 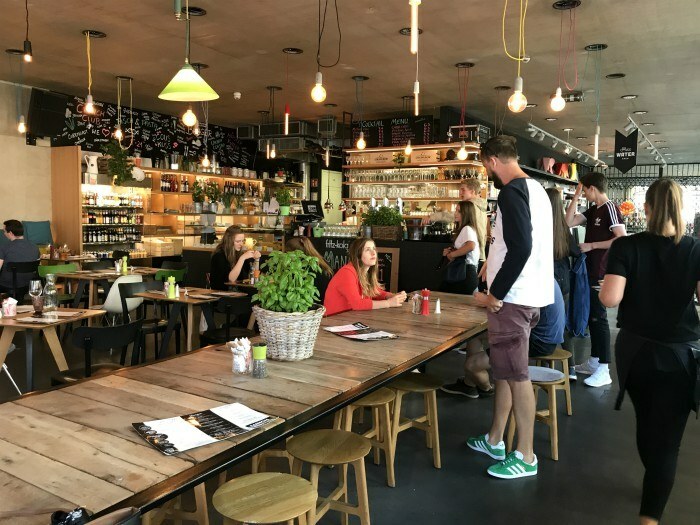 This all-day café is a great choice for vegetarian and vegan food in Graz, open for breakfast, brunch and throughout the day until late, serving burgers, salads and bistro dishes in an airy industrial style space. 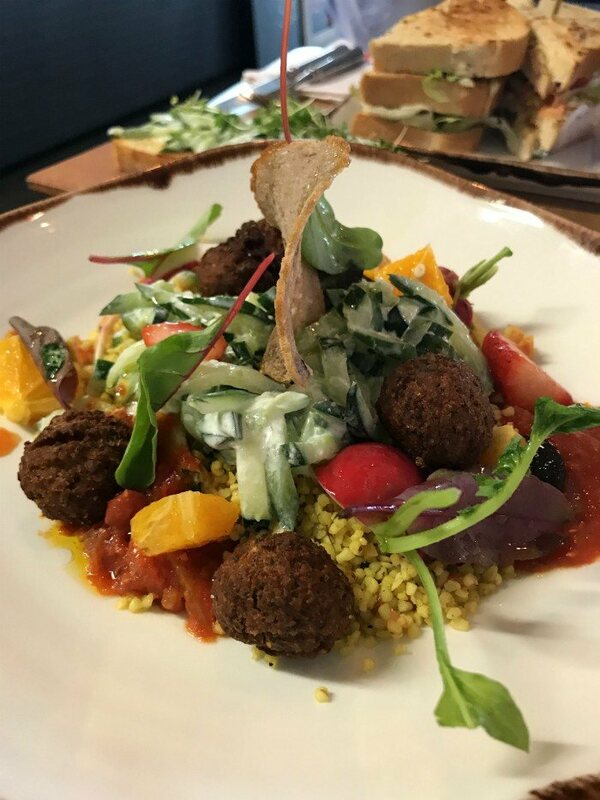 I made the healthy choice of a Friendly Slow Food salad, which was colourful and tasty with falafel and bulgar wheat (€12). Kunsthaus cafe, Sudtirolerplatz 2, 8020 Graz Open daily (even Sunday) from 9am to late. There was the queue outside Eis Greisler that made me notice this small ice cream parlour on Sporgasse, one of the oldest streets in Graz that follows the line of an old Roman road. 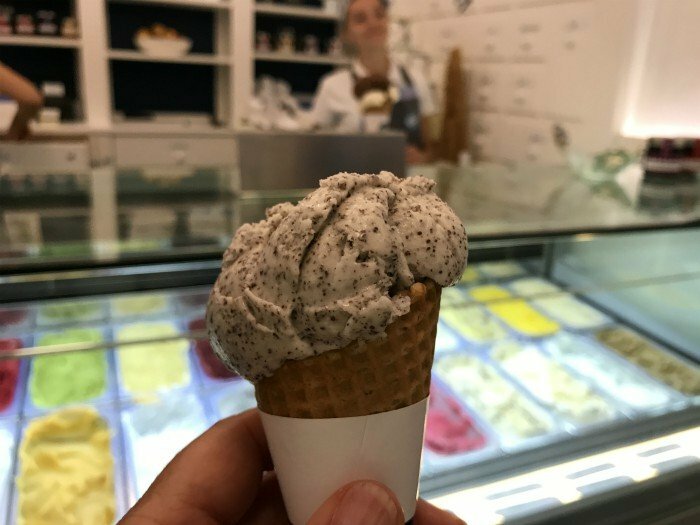 If you’re sightseeing on Herrengasse or admiring the pastel stucco buildings that surround the central square of Hauptplatz, you’re only a short stroll away from their delicious ice creams. They are made with fresh ingredients and organic milk from the family farms, and have several branches throughout Austria. My choice was poppy seed as I thought it had a rather Austrian flavour and a must try flavour when in Graz, Austria, normally found sprinkled on the breakfast rolls, and there’s also pumpkin seed oil flavour as well as the more usual fruit flavours. 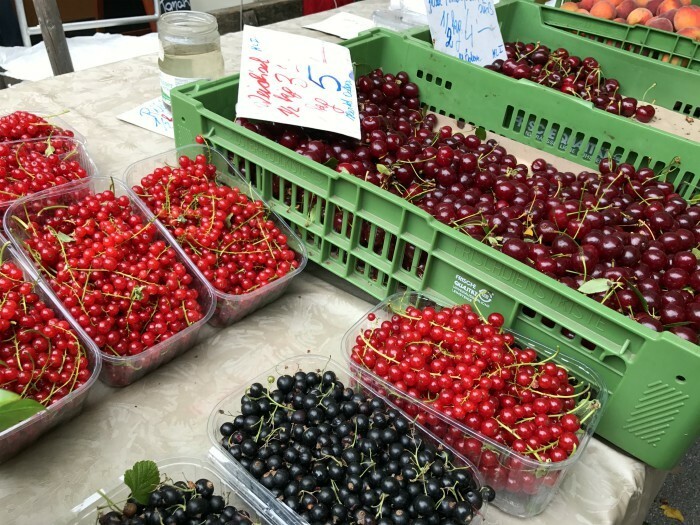 Oh, those glistening redcurrents and glossy cherries were so tempting in the farmer’s markets of Graz! 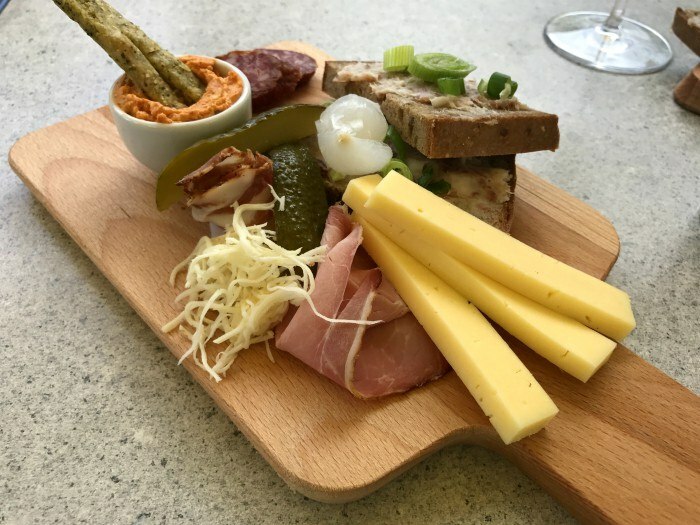 Perfect to add to your basket of crusty country bread and local cheeses to have a picnic in front of the Orangerie in the Burggarten, or at the top of the Schlossberg. 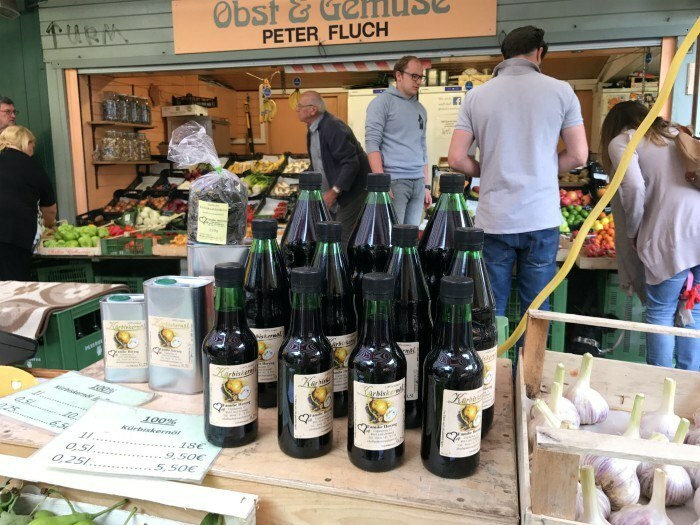 With 800 farms just within the city, the farmer’s markets are the place to come for local food in Graz that are all freshly picked and grown by small scale producers. 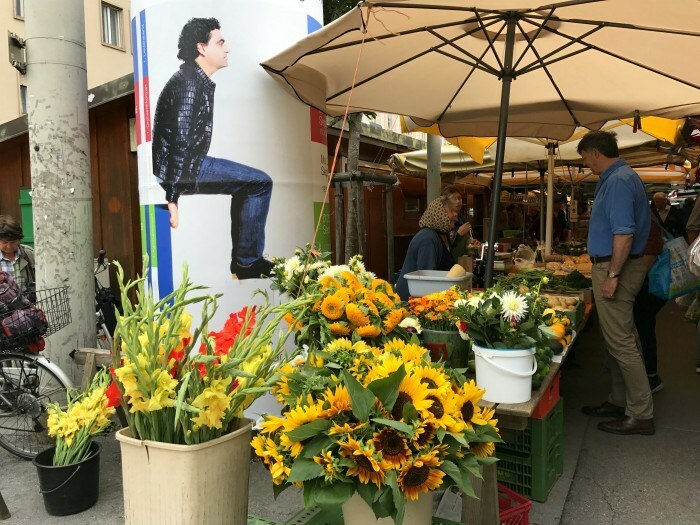 There are markets held daily around Graz with the best known being those at Kaiser Josef Platz and Lendplatz, where the stalls are set up early and are starting to close down by lunchtime. 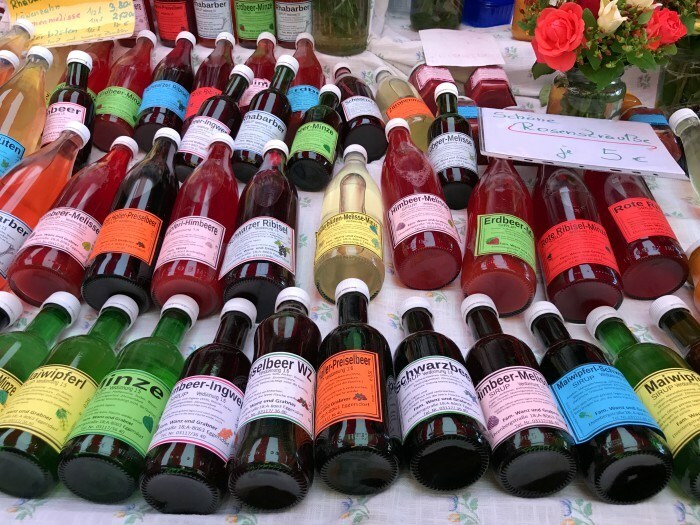 You’ll find delicious fruit juices, smoked sausages and flowers from the garden too! Along Herrengasse and all around the old town of Graz you will spot archways that might perhaps lead to the courtyard of an old residence. These were once the internal courtyards where animals were kept, but now you can feel free to wander through them where you’ll find a hidden world of boutique and cafés and some of the top restaurants in Graz. 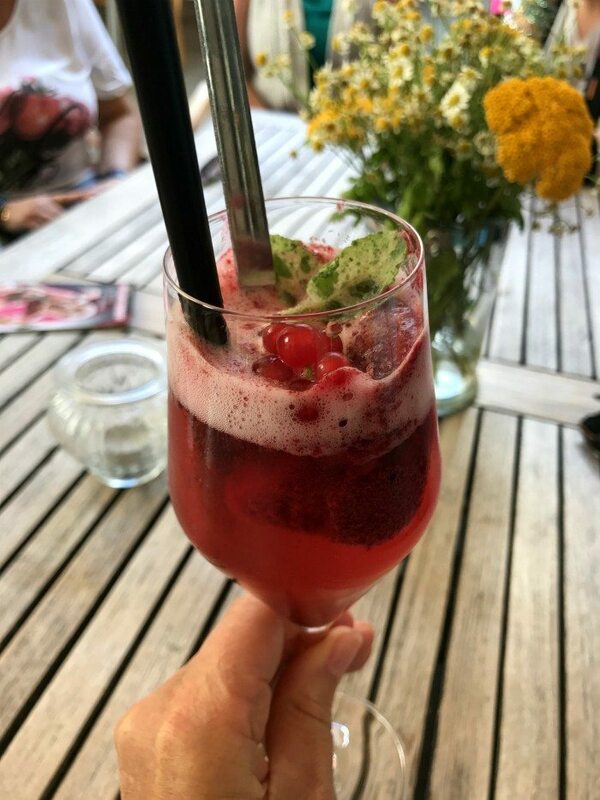 We stopped in one such at a café for a delightful aperitif of sparkling wine, summer berries and sorbet, a real taste of summer. 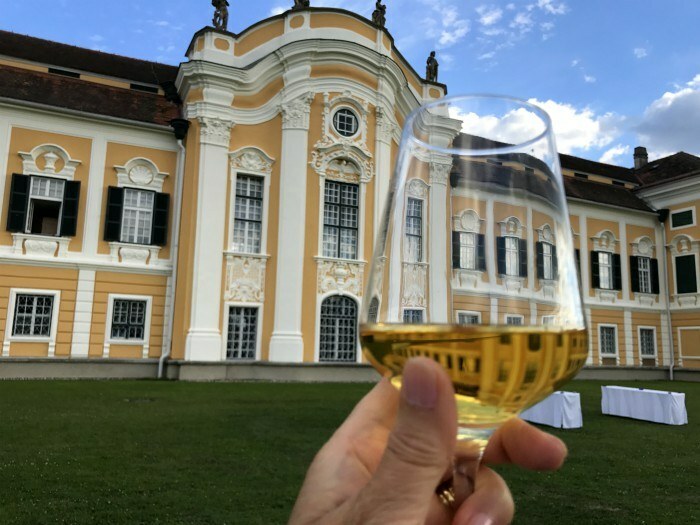 There are plenty of delicious Styrian wines that are produced just south of Graz with popular wine routes to lead you around the vineyard regions. A popular choice is Schilcher crisp rose wine that makes a refreshing aperitif but there are many more to choose from. 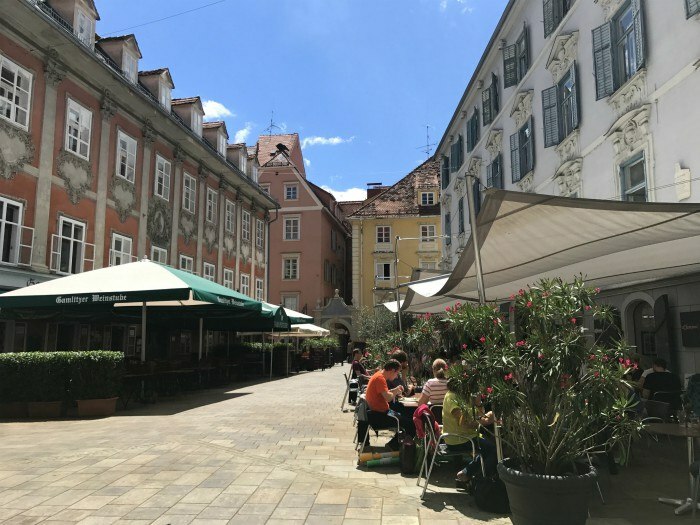 Around the old town, the restaurants of Graz move outside in summer and life is lived on the busy outdoor terraces with their large sunshades. The inside of the restaurant is kept free just in case there’s a rain shower and everyone needs to move indoors. 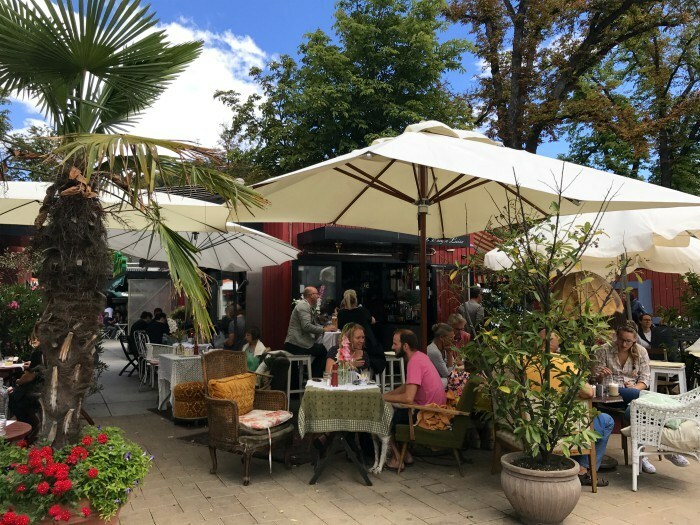 There are such a concentration of bars and restaurants in the pedestrianised streets around Mehlplatz, Farbergasse and Glockenspielplatz, that locals call it the “Bermuda Triangle” of Graz. It’s a place you could get lost in for hours as you move from one charming bar to the next meeting old friends and acquaintances, and we think it sounds an attractive prospect for visitors too! 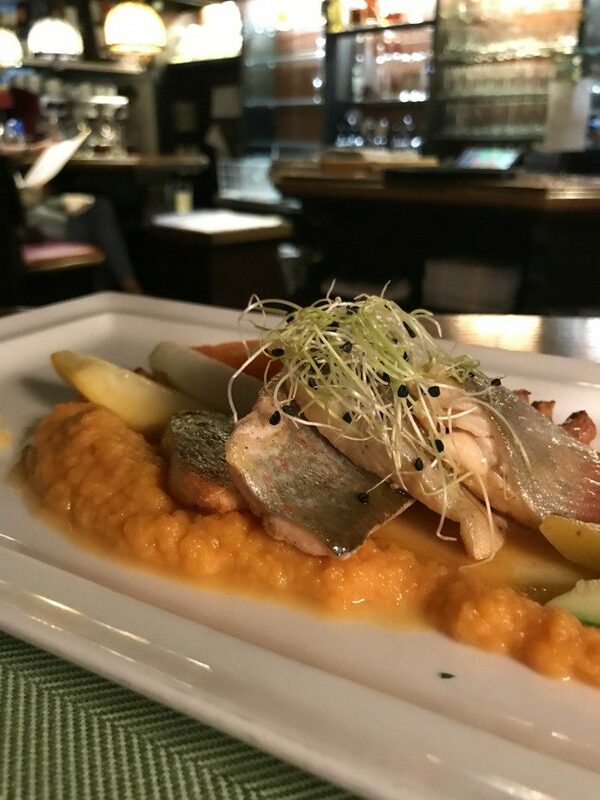 A typical dish that’s served in the best bars and restaurants of Graz is the Brettljause, a wooden sharing platter with a selection of local Styrian delicacies. They would typically be served in a Buschenshank along the Styrian wine routes, especially around the harvest time – a small farm or inn where a bunch of twigs would be displayed outside to indicate that the new wine is ready and available for sale. Traditionally everything on the platter would have been produced by the farmer themselves. 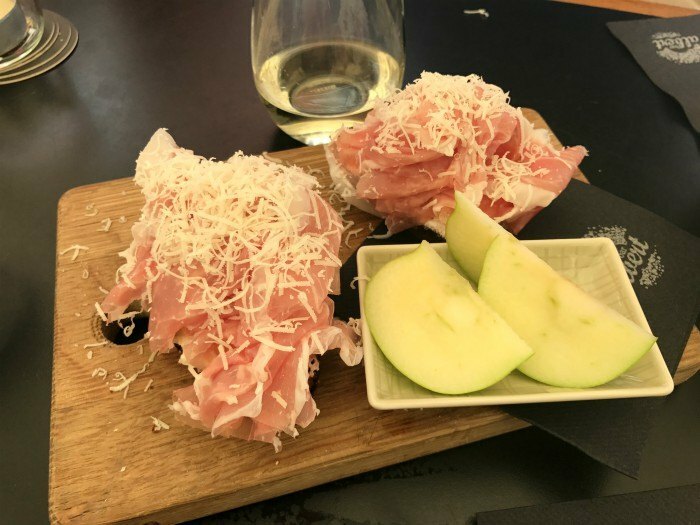 You might find Volcano ham, a cured ham from the volcanic region around Auersbach, together with a Liptauer dip made from cream cheese, the Verhackert soft pate made with pork lard and some freshly grated horseradish. We tried our Brettljause at: StadtSchenke (Neutorgasse 22) a restaurant that runs as a social project and Bar Albert (Herengasse 11) just opposite the Visitor Information centre. 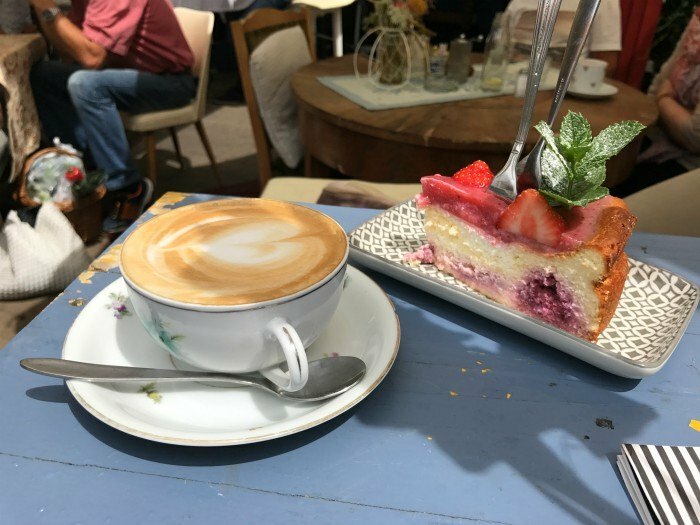 This tiny cafe is housed in a hut in the Lendplatz market, but in summer it spreads outward in a jumble of vintage tables and mismatched chairs under large sun umbrellas. You’ll be served fresh coffee in antique floral china with pretty cakes and pastries. The cafe does brunch and a light lunch too with everything fresh from theGraz markets as you’d expect. For some reason pumpkins thrive in Styria. I imagine that there must be huge fields of pumpkins all around Graz because they appear in every farmer’s market and on every menu in the form of pumpkin seeds and pumpkin seed oil. The ‘green gold’ of pumpkin seed oil makes a rich, nutty salad dressing and it’s even been known to be drizzled on ice cream. The seeds are also thrown into salads but I also spotted them clothed in white chocolate – now that’s my kind of healthy snack! I saw bottles of pumpkin oil on sales in the market as well as gorgeous biscuits and breads sprinkled with the seeds. It left me wondering what happens to all the pumpkins that the seeds come out of as funnily enough I didn’t notice pumpkin being used as a vegetable, but perhaps it just wasn’t the right season. 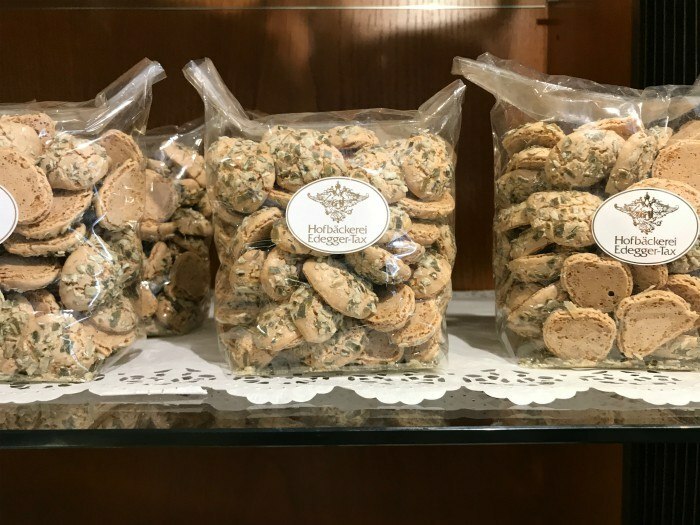 When shopping for foodie souvenirs in Graz to bring home, you might like to stop at the Royal Court Bakery Eddeger-Tax for some of their tiny Sissi kisses almond biscuits. 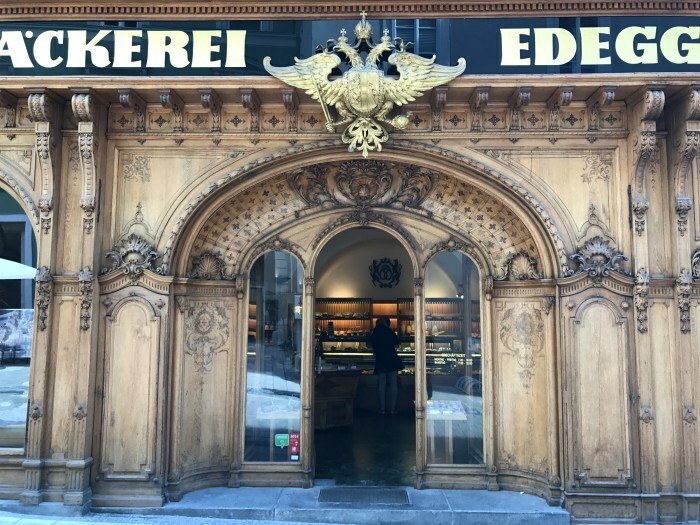 The sweet confections are named after the beautiful Sisi, Empress Elizabeth of Austria and the front of the bakery is impressively carved wood with the gold eagle over the door leaving no mistake about the Royal patronage that the bakery enjoyed. 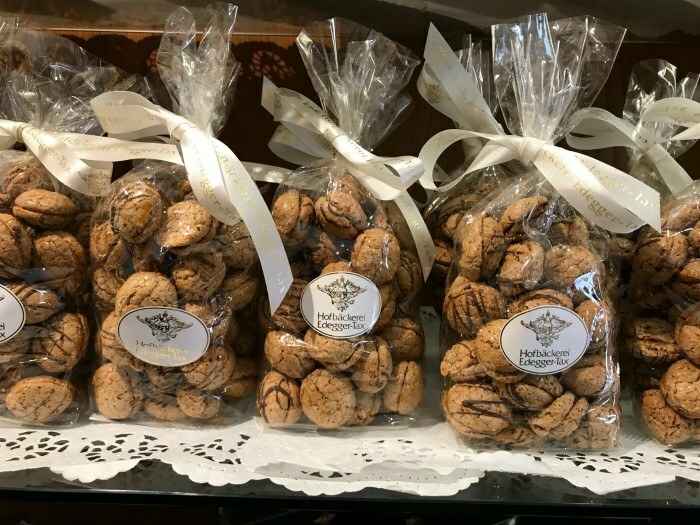 They have a large variety of other sweet biscuits and chocolates on sale in pretty gift boxes and the tiny Sissi kisses with their chocolate filling are just the thing to accompany your morning coffee. 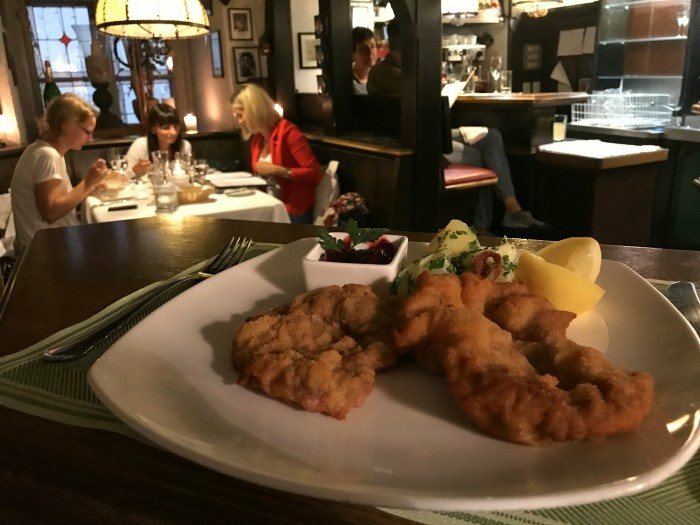 As evening approaches, it’s time to move inside to a cosy gasthaus to try some Styrian specialities. We can recommend Stainzerbauer with its traditional pub interior, where we sat on bar stools next to the old stove at the door. I tried the pan-fried char on a bed of sweet potato and vegetables, while Guy ordered a schnitzel with cranberries and parsley potatoes, both delicious. They serve classic dishes using all the local ingredients – you’ll find pumpkins, volcano ham, horseradish, Styrian beef and river fish on the menu, all cooked with a light modern touch. We flew direct from Birmingham to Graz with bmi regional who fly three times a week between Birmingham and Graz on Monday, Thursday and Friday. All fares include a generous 23kg of hold luggage, a complimentary in-flight drink and snack, allocated seating and a speedy 30 minute check-in. An easy alternative airport from the UK is Vienna (2hrs 10 min drive) where you can pick up a hire car or take the efficient coach service with Flixbus. You can also fly into Vienna and then transfer by short internal flight to Graz airport. 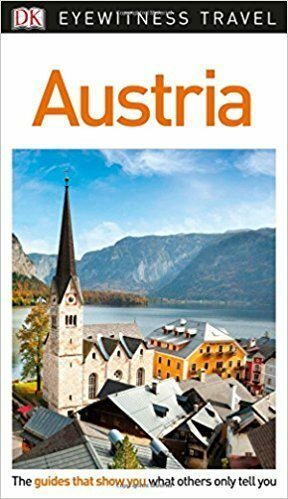 Need a guidebook for Austria? For further information on visiting Graz, check out the Graz Tourism website and follow their social channels on Twitter @VisitGraz | Facebook | Instagram. Once you arrive, visit the tourist information office at Herrengasse 16 for lots of helpful information and to book tours. For more information on holidays in Austria visit the Austria Tourism website. The central area of Graz on either side of the river is easy to cover on foot and many of the streets are pedestrianised. If you need to get a little further, just jump on a tram where you can ride for free for a couple of stops in the central area between Jakominiplatz and Hauptplatz and one extra stop beyond in either direction. Look out for the Altstadtbim sticker indicating which are the free stops. Otherwise a tram or bus ticket that covers you for 1 hour of travel only costs €2.30 and can be bought from the ticket machines on board each tram. 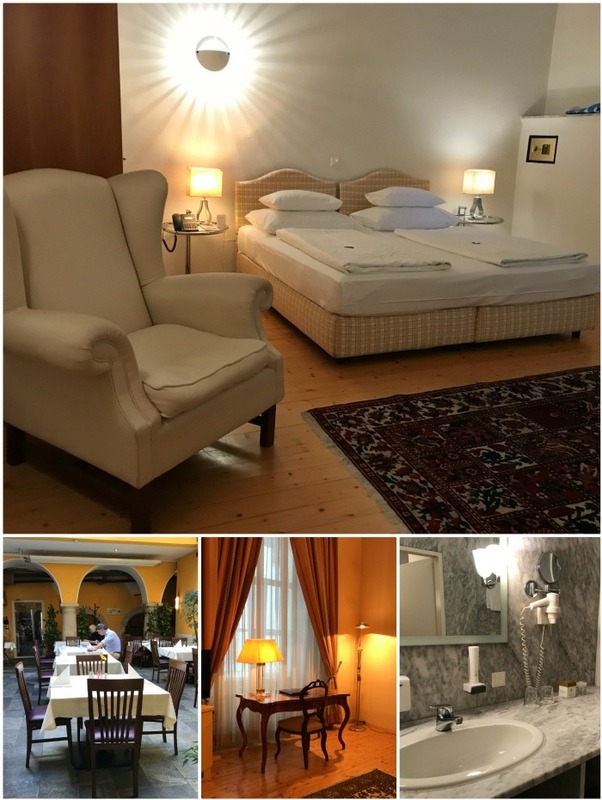 We enjoyed our stay at the Hotel Zum Dom Palais Inzaghi, in the old quarter of Graz close to the cathedral. Parts of the 29 room hotel hark back to the 14th century when the ground floor was used for commercial purposes. The staircases with fine plaster mouldings, wrought iron staircases and stone floors retain the 18th century style of when it was bought by the Count of Inzaghi. Each of the rooms is individually designed with traditional elegance and a mixture of antique furniture and more modern pieces. Our suite No 18 named “Peaceful Outlook Room” was very spacious with high ceilings, brocade curtains at the window, a comfortable wing chair and an oriental style rug. The adjoining sitting room also had a mixture of antique and modern furnishings, with the elegant burr walnut desk, wooden flooring and original artworks on the walls. Our bathroom had a jacuzzi style bath which gave us lots of bubble bathtime fun, with a shower above and a vanity surface and flooring of white and grey marble. In keeping with the Austrian eco-sensibilities, there was hand soap and shower gel in refillable containers, but also smaller bottles of individual toiletries, should we need them. Breakfast was served in the courtyard dining room, with a glass roof which gave it a light and airy feel, and some more tables in the side room where the breakfast buffet was laid out. 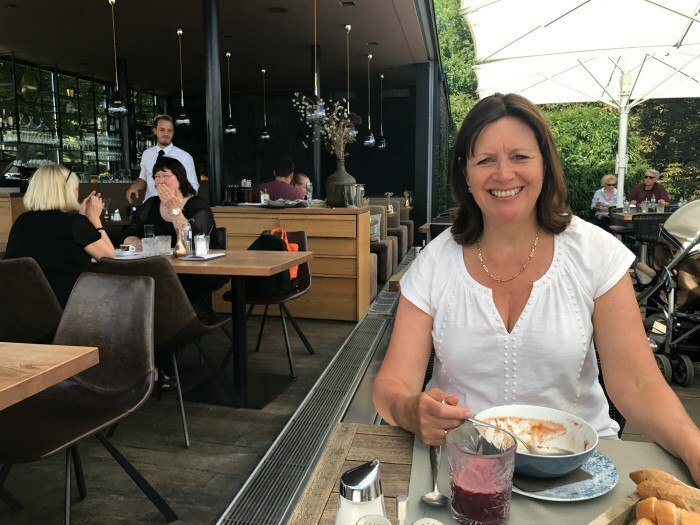 I love breakfasts in Austria as there is invariably an excellent selection of local foods, and here we had lots of fruit teas, local apple juice and a fine selection of bread, pastries, yoghurts, cereals, cheese and hams. Around the hotel are original pieces of artwork with quirky ceramic pieces by sculptor Erwin Schwentner at the door of each room. We’d recommend this hotel as a friendly and comfortable hotel with individuality and charm, which is very well located to see all the sights during a short break in Graz. 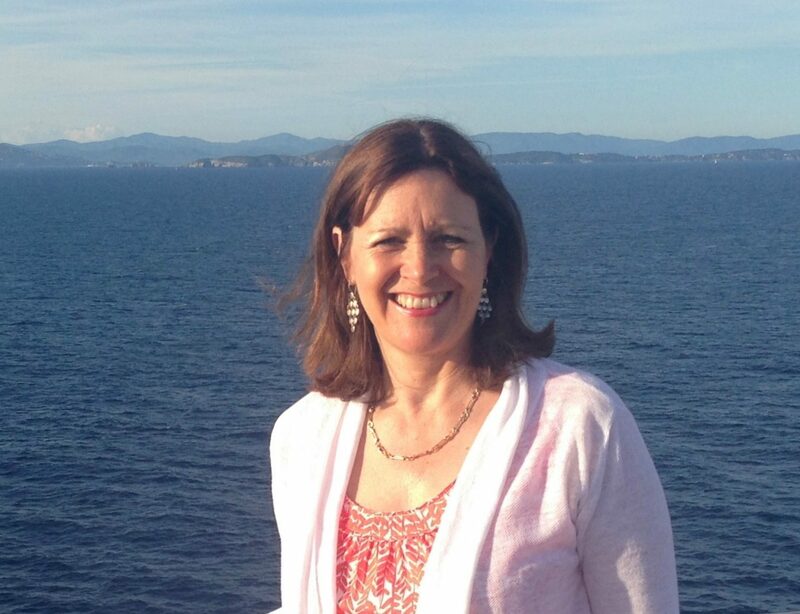 Some of the links in this article are affiliate links that earn me a small commission. Oh those cheese platters look fantastic! I do cheese platters at home, but yours are beautifully designed and very colourful. Mine are *cough* a bit utilitarian. @Hels They are beautiful and the idea was that everything would come from the farmer’s own produce. “Explore Graz’s creative quarter on the left bank of the river…” is incorrect because it is the RIGHT bank of the river Mur. 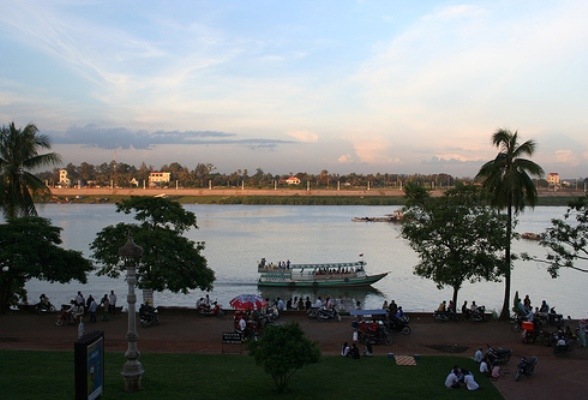 Left and right of a river is always seen from the flow direction of a river ? For the rest: very nice!!! the usual suspects are in the article (though some geheimtipps are missing) and what you hardly ever find in an article like this is some words of the Styriarte ? Well done! @Martin Thanks so much, I musy admit I was a bit unsure how to describe the ‘other’ bank but I’ll correct that. I really enjoyed the Styriarte events that I attended, I guess we were lucky to be there at the right time of year. Of course always happy to hear any local’s tips you may have, in a short visit one can never see everything.